When making this pilaf, you’ll first warm up the liquid you need. Then you’ll saute the pasta and rice for a few minutes and then pour the warm liquid right into the skillet. This will “shock” the pasta and rice and it will then quickly absorb the flavors and depth from the chicken broth, the garlic and the oil. Once it’s cooked and fluffed, then you can fold in the magic…I mean, the pesto. It’s a side dish made with common, every day ingredients….that are magically dressed up with the flavors of basil and Parmesan from the pesto! Add 2 cups chicken broth, 4 Tbsp butter, 1 tsp salt and 1/2 tsp pepper to a small saucepan, and bring to bubbling. Break 1 small bunch of vermicelli noodles into 1/2-inch length pieces. You’ll need about 1/4 cup of broken noodles. Recommend using knife to break them down into these 1/2-inch length pieces. Add the olive oil to the skillet, and heat over medium high heat. Add the vermicelli noodles, and sauté for 2 to 3 minutes, tossing often. Then add the rice and minced garlic, and toast with the vermicelli for another 2 to 3 minutes, or until vermicelli begins to turn golden. Immediately pour in the warmed chicken broth mixture, and bring to bubbling. Cover, reduce heat to simmer, and let cook for 15 to 18 minutes, or until rice is fluffy. Once rice and vermicelli are fork tender, fluff and then gently fold in the pesto sauce, to taste. Start with 2 Tbsp, then add 1 tsp at a time, to your liking. 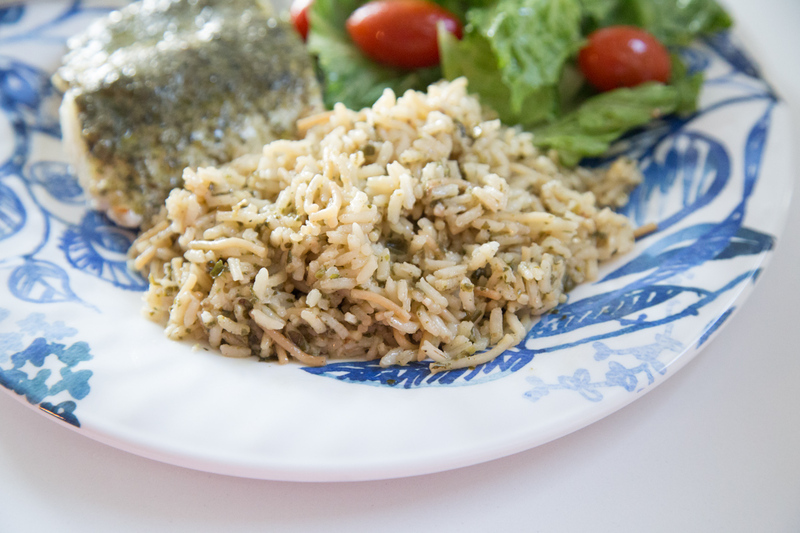 Serve Pesto Pilaf as side dish for baked chicken, fish or steak.